The Yosami Radio Transmitting Station in Kariya (then called Yosami Village, Hekikai-gun), Aichi, Japan was accredited the IEEE Milestone, in 2009, as the Japan’s first wireless telecommunication station with Europe built in 1929. From the Meiji to Taisho eras in the turn of the 20th century, Japan became active in diplomatic and trade relations with countries overseas, thus speedy communications were prerequisite. Initially submarine cables were used, then the VLF wireless communications were put in use, and the Iwaki Wireless Telegraph Station to the U.S., with the Hara-no-machi Radio Transmitting Station, was constructed in Fukushima Prefecture, in 1921. The site of radio transmitting station of the wireless telegraph station to Europe was decided at the Yosami Village (1906-55), current Kariya, in the suburbs of Nagoya, central Japan, and thus the Yosami Radio Transmitting Station was built in 1929. 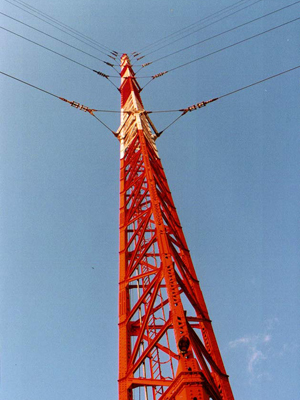 The High Frequency Generators and other transmitting equipment were made in Germany and exported from the country while the eight 250-m high steel towers and antenna wires were made in Japan. The Yosami Radio Transmitting Station transmitted VLF signals to cities in Europe, such as Warsaw, Berlin, London, Paris, Geneva, and Rome in 1929-1937. Soon the major role was taken by short wave transmitters. With the outbreak of World War II, however, the Yosami Radio Transmitting Station was employed by Japanese Imperial Navy for telecommunication to war submarines for the penetration of VLF into the sea. It is believed that a war attack message code of “Climb Mount Niitaka 1208”(a war attack on December 8) was relayed through Yosami from Tokyo in December 2, 1941. At the end of World War II in 1945, the Yosami Radio Transmitting Station was destined to be dismantled; however, it was requisitioned by General Headquarters (GHQ) in 1950 to be used by U.S. Navy. The Station had been used for communicating with their submarines from 1952 to 1993, and the Station was returned from U.S. Navy to Japan in August 1994. 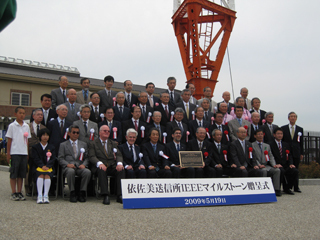 Meantime, in 1989 the Memorial stone monument of the Birthplace of Radio Telecommunication with Europe was erected by Shizuo Honda, of the Institute of Electronics, Information and Communication Engineers, and after the return of the Station, the civil movements to preserve the Yosami facilities by engineers and local people enhanced. In 1996, the Yosami Radio Transmitting Station was recognized as recommended industrial heritage by the Japan Industrial Archaeology Society, the preservation of the Yosami Station buildings and steel towers was appealed. Yet due to constraints, such as financial one, the eight steel towers are demolished in 1997, following by Station buildings in 2006. Meanwhile, one of two High Frequency Generators, the most noted industrial heritage, was put into a dismantlement investigation and the other was housed, with other transmitting equipment, in the Yosami Radio Transmitting Station Memorial Museum opened by City of Kariya in 2007. What is the Yosami Radio Transmitting Station like? Copyright©　2011 Kotaro Tanaka, Shoji Ishida, and Tetsu Suzuki. All rights reserved.